Introduction: Strontium ranelate, a strontium (II) salt of the ranelic acid, is a drug treatment for osteoporosis which reduces the risk of broken bones. The drug is unusual in that it both increases deposition of new bone by osteoblasts and reduces the resorption of bone by osteoclasts. It is therefore promoted as a “dual action bone agent” (DABA). Furthermore, various clinical studies demonstrate the ability of strontium ranelate to improve and strengthen intrinsic bone tissue quality and microarchitecture in osteoporosis by way of a number of cellular and microstructural changes by which anti-fracture efficacy is enhanced. The European Pharmacovigilance Risk Assessment Committee (PRAC) recommends restriction in the use of strontium ranelate, based on a routine benefit-risk assessment of the medicine, which included data showing an increased risk of heart problems, including heart attacks. Several different forms of strontium are used as medicine. Scientists are testing strontium ranelate to see if it can be taken by mouth to treat thinning bones (osteoporosis) and arthritis. Strontium chloride is the most common form of strontium found in dietary supplements. People use supplements for building bones. But there isn’t much scientific information about the safety or effectiveness of strontium chloride when taken by mouth. 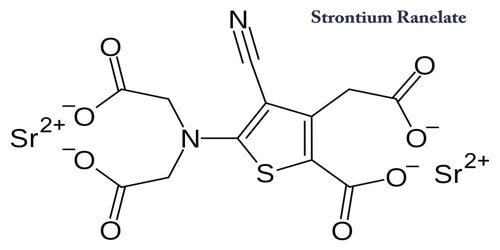 Mechanism of Action of Strontium Ranelate: There is a substantial amount of evidence supporting the biological dual mode of action of strontium ranelate that has appeared in the medical literature in recent years. 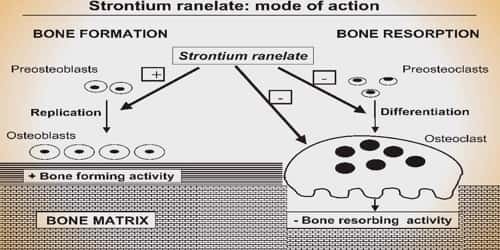 In fact, regarding bone-forming mechanisms, strontium ranelate is known to increase in vitro osteoblast differentiation from progenitors, as well as osteoblast activity and survival, and regulate osteoblast-induced osteoclastogenesis both in vitro and in vivo. Concerning bone-anti-resorbing mechanisms, strontium ranelate decreases osteoclast differentiation and activity, while increasing their apoptosis. Strontium, which has the atomic symbol Sr and the atomic number 38, belongs to the group II in the periodic table of the elements, just beneath calcium. Because its nucleus is very nearly the same size as that of calcium, the body easily takes up strontium and incorporates it into bones and tooth enamel in the place of calcium. This is not a health problem and in fact, it can provide a health benefit. Furthermore, strontium ranelate is also thought to be capable of stimulating osteoblasts to enhance the expression of osteoprotegerin while also concurrently reducing the expression of receptor activator of nuclear factor kappa-Β ligand (RANKL) in primary human osteoblastic cells. 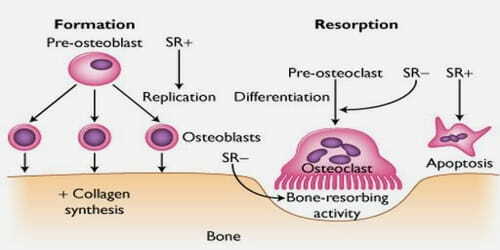 Strontium ranelate also stimulates osteoblasts to secrete osteoprotegerin in inhibiting osteoclasts formed from pre-osteoclasts in relation to the RANKL system, which leads to the decrease of bone resorption. Additionally, strontium from administered strontium ranelate is absorbed onto the crystal surface of treated bones and only slightly substitutes for calcium in the apatite crystal of newly formed bone. Although strontium ranelate use can increase BMD some of the observations may be overestimations due to the skeletal accretion of strontium in strontium ranelate-treated patients. Uses and Effects of Strontium Ranelate: Strontium ranelate is registered as a prescription drug in more than 70 countries for the treatment of postmenopausal osteoporosis to reduce the risk of vertebral and hip fractures. In the United States, strontium ranelate is not approved by the FDA. In the United Kingdom, strontium ranelate is prescribed under the National Health Service as a medicine for the treatment of postmenopausal osteoporosis. Strontium ranelate is taken once daily preferably at bedtime at least two hours after eating, and at least two hours before any food or drink, other than water. This is because the absorption of the drug may be affected if food or drink other than water is present in the stomach at the same time. Strontium ranelate shows anti-fracture efficacy in very old elderly and osteopenic patients. According to the manufacturer, strontium ranelate should be taken 2 hours apart from food, milk and derivative products, and medicinal products containing calcium. Should be taken 2 hours before antacids. Treatment should be suspended while taking oral tetracycline and quinolone antibiotics, as these chelate the strontium ion. Strontium ranelate has been withdrawn worldwide owing to an increased adverse cardiac effects profile along with increased risk of venous thromboembolism (VTE) and various life-threatening allergic reactions. Strontium ranelate increased the risk of venous thromboembolism, pulmonary embolism and serious cardiovascular disorders, including myocardial infarction. Its use is now restricted. The most common side effects include nausea, diarrhea, headache, and eczema, but with only 2–4% increase compared with placebo group. Strontium ranelate is generally prescribed long term so the patient needs to be happy with the treatment. Although it is important that they take the treatment as instructed, missing the odd sachet will probably not have an impact on their bone health in the long run but they should avoid this if they can.